Alan Joseph Bauer and his son Yehonathan are plaintiffs in the Sokolow v. PLO case. They were injured in a homicide attack on March 21, 2002. General Wendt: I was extremely troubled to read of your role in attempting to modify or retract the recently-passed Anti-Terror Clarification Act (ATCA). I am one of the plaintiffs of Sokolow v. PLO. In our case, we proved in court that Palestinian Authority (PA) security officers murdered and maimed U.S. citizens—including me and my son. Terrorists who committed these atrocities were convicted or pled guilty, and yet they remain on the PA payroll, collecting generous benefits and promotions. My son and I survived, but we have to live the rest of our lives forever altered by the attacks. Other plaintiffs lost loved ones in the Hebrew U. cafeteria bombing. We have been fighting for justice since 2004. We believe that the rights of American citizens to see justice as enshrined in the original AntiTerror Act (ATA) statute is extremely important and worthy of consideration. Just as a little background, I am an American citizen, born in Chicago, educated at Harvard and Wisconsin, and here today in Jerusalem with my family 26 years after receiving a Fulbright postdoctoral fellowship courtesy of the US government. 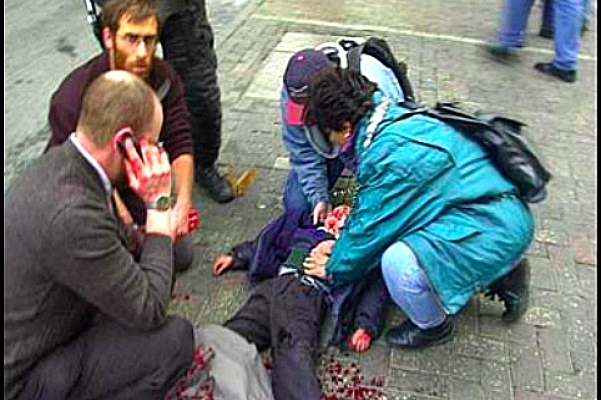 Our oldest son (also an American citizen) and I were blown up on King George Street on 21 March 2002 by a Palestinian policeman trained and sent by an officer of the Palestinian intelligence services to kill Jews (as per the indictment of the latter). 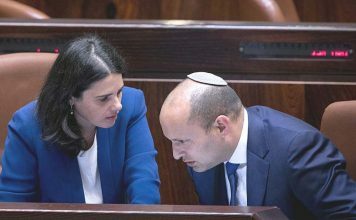 We joined ten other American families in 2004 in filing Sokolow and in February, 2015 we won a $655 million judgment against the Palestinian Authority (PA) and PLO. Rather than help us to settle our case, the State Department filed a brief on behalf of the PA and PLO to seek a reduced appeal bond. At the Second Circuit Court of Appeal, the verdict was voided, not because of any lack of guilt (the PA and PLO were found guilty on all 24 counts), but rather because the PA was considered not to be “at home” in the US for the purpose of being sued in a federal court over terror charges. The ATCA was prepared and passed by Congress and signed by President Trump to seal this hole, whereby terrorists can kill and maim American citizens and then claim that they are outside of the law in the US. While your intentions may be security coordination, efforts to help the PA escape accountability will ultimately make the world a more dangerous place for American citizens and will most certainly snuff out the ability of my family and other American families to realize justice after so many years. Your efforts would be far better spent convincing the PA to settle their debts to American citizens rather than to make efforts that may undermine the ability of your fellow countrymen to realize justice. It pains us to again see our Government completely ignoring our rights and siding with terrorists found liable by a jury in a federal court. Below is a picture from moments after the attack. Yehonathan was seven years old when the head of a Philips screw passed fully through his skull, causing permanent brain damage. Today he is 23 and through great drive and effort he holds Nevada and Israeli driver’s licenses. I had two screws pass through my left arm. General Wendt, we are seeking justice, not revenge. Please join us in helping end this case in our favor. Please go on with the security coordination, but general, please not at our expense. Help us to realize justice as proud American citizens. 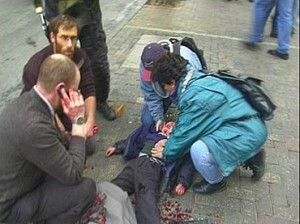 Alan Joseph Bauer stands over his son Yehonathon, minutes after they were injured in suicide bombing attack in Jerusalem on March 21, 2002.